will let people know how to act in the face of an emergency. You can buy it here, from spreadshirt (for men, women and kids). Yes, folks, the Keep Calm Squirrel is back with his funny antics. And this time, he's wearing a crown! What could be more appropriate than to listen to the advice of the King of Squirrels? The royal "Keep Calm and Carry On" poster used by the British government right before World War II has taken many forms since becoming a recent pop culture icon. But this funny parody clearly tops them all. Unless you prefer birdseed, in which case, check out: Keep Calm And Eat Birdseed. 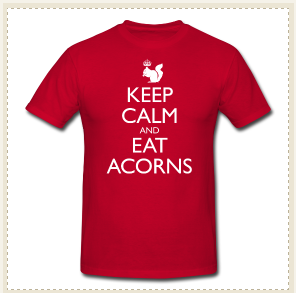 You can also buy this Keep Calm Squirrel shirt as cards or posters at Redbubble! If you like this funny squirrel t shirt, you might also like this one: Keep Calm and Squirrel On.